If the spinach is raw, cook and slice thinly. If frozen, defrost. In either case, mix the feta cheese with the spinach to make a mixture, adding the chopped garlic. Spread some butter on an oven tray. Open the filo package and place each thin pastry (it is as thin as paper) on the tray, buttering each one using a brush. 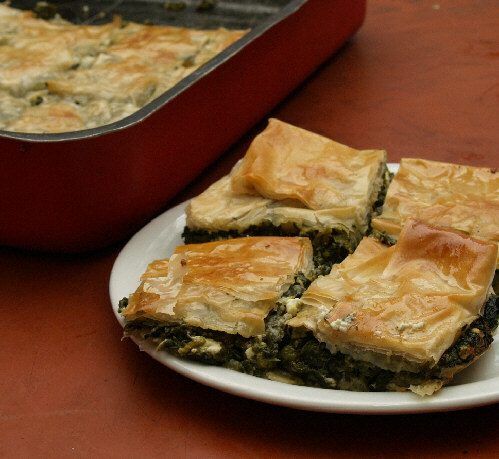 After you have done 8 filo slices, place the spinach/feta mixture and spread over the entire oven tray, covering the 8 pastry slices. On top of this, place the remaining pastry slices, buttering each one of them as well. Notch the last one creating 2 inch (5 cm) on a side, squares. Place in a medium heat oven and cook till brown.